It's official guys. 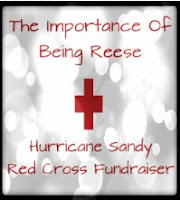 I have a Hurricane Sandy Donation page. This fundraiser benefits the American Red Cross, so all donations will immediately and directly go to those who need it. I know the news has stopped talking about the devastation, but those people who were affected are still very much in need of our help. As we prepare to celebrate Thanksgiving, I ask that you think of those who cannot, and will instead be in a shelter with hundreds of other people.What better way to celebrate your Thanksgiving by sharing some of your blessings with someone who is less fortunate? If you would like to donate, you can check out my crowdwise page here. Or you can hit my Red Cross donation button in the top right hand corner of the screen. It only takes about two minutes, is completely secure, and the donations will directly and automatically go through to the Red Cross. Please, please, please think about these people who still need your help. Also, I mentioned this to a few others, but I'm going to be hosting a Hurricane Sandy link-up and am still looking for co-hosts and participants. If you're interested and would like more info, shoot me an email at tasutton22@gmail.com and I'll get back to you. My heart still goes out to those who are continuing to deal with the aftermath of Hurricane Sandy. I was watching CNN while in the bank the other day and this one family has been without power for over 200 hours! They can't afford to stay in a hotel or gas to compute to a shelter. So, they're staying in their home while they try to gut out the main floor that was flooded and get the wiring replaced. It just pulls at my heartstrings. Kudos to you and everyone else who is doing there part to make sure these people get back on their feet! hi, i'm following the GFC blog hop. i would love for you to visit my blog and follow if you like it. Hi there, is this your one and only website or you in addition to that own some others?